It’s The Season To Think About Fingerless Mitts. Ya know, if someone would have suggested fingerless mitts to me a couple of years ago, I probably would have asked them if they’d fallen and bumped their head. Then, in a “need a gift, quick” fit I knit some up. Needless to say, they never made it to their intended recipient. And they have, since then been fairly worn out. Ravelry to the rescue! 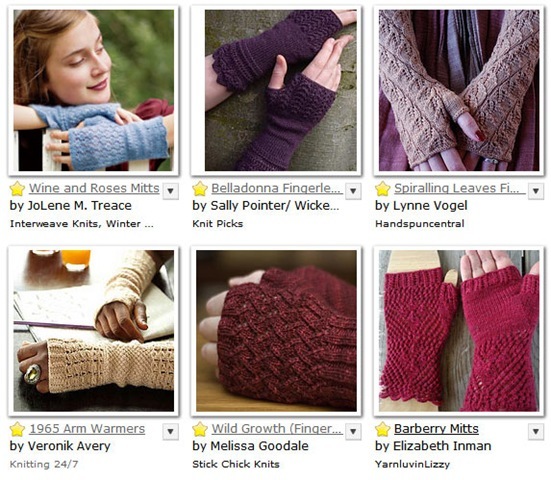 Click HERE to go to the Knit Finder Blog and see their Fingerless Mitts Roundup!